You can finish your tax return in just minutes! Etax won the Canstar Blue “Most Satisfied Customers Award – tax agents, 2018″. Consumer reviews about Etax often mention friendly service, excellent value, the amazing online tax return, better tax refunds, or simply the comfort of knowing your tax return was done right. The ratings speak for themselves! In addition to the Canstar #1 rating, Etax is Australia’s best-reviewed tax agent on ProductReview, Facebook, Google and TrustPilot. Why do your tax return at Etax.com.au? Etax Prefill can do half of your tax return for you! Most people finish their tax return in minutes! What’s the best way to do my tax return? Etax constantly surveys users. We ask for your feedback, ratings and suggestions. Why? Well, we really want to be the best at what we do. So, our team of tax accountants and software experts work all year round, trying to make the tax return easier, and to improve Etax service and support. That all happens based on the kind, thoughtful, valuable feedback we receive from Etax users. 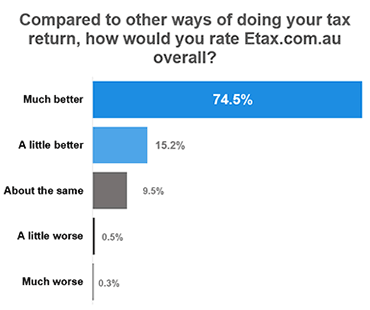 In our July survey, 98 per cent of people said they’re so happy with Etax, they will recommend it to friends and family when they do their tax return. But that doesn’t mean our job is done. Our team honestly works non-stop trying to make it all work better for everyone. We don’t want to leave anyone behind, because everyone deserves a fair tax refund and good tax agent service for a fair price. How do most Australians do their tax return? The ATO confirms that most taxpayers prefer to use a tax agent like Etax.com.au to lodge their tax return. 74 per cent of lodgements are completed with the help of a tax agent. This has been almost unchanged for years, in spite of ATO marketing and media that tell us we should do it ourselves with ATO myTax. Why doesn’t everyone go it alone with myTax? Because we are all free to get tax help from someone who’s on our side. You can get the confidence of tax agent support and checking, with online convenience, at Etax – the leading online tax experts in Australia. Plus, the low “once-per-year” fee is also tax deductible! Everyone who earned money in the past year needs to do a 2018 tax return. From students to retirees, graduates to CEOs, “just starting” all the way to landlords and investors, Etax is here to serve almost every Australian. Etax makes tax returns easy.